Luxaire extends sponsorship of Make-A-Wish into 2014. The Luxaire® brand of heating, ventilation and air-conditioning equipment recently renewed its commitment to helping children with life-threatening medical conditions by signing its fourth multi-year contract with Make-A-Wish®. This extends the relationship with the wish-granting organization into 2014 and commits $750,000 in contributions over three years. 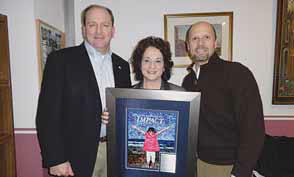 Luxaire first embarked on a sponsorship of Make- A-Wish in 2001. Since that time, Luxaire has donated more than $2.4 million to the organization, enough to grant nearly 330 wishes. Last year, 2011 marked the 10-year anniversary of Luxaire’s support of Make- A-Wish. To celebrate a “Decade of Wishes Come True,” Luxaire brand manager Mary Mocarski and members of her senior leadership team traveled to Luxaire distributor locations to personally thank distributors for their support of Make-A-Wish. Last year alone, the company sponsored wishes and events with 33 Make-A-Wish chapters across the country. One of these chapters, Make-A-Wish® Wisconsin, recently honored Luxaire’s commitment by presenting the foundation’s annual recognition plaque to Rodney Rushing, Johnson Controls vice president and general manager, Unitary Products.